Jack Nakash and Marcelo Pontin, Civil War Living Historians and Reenactors, discussed their portrayals, equipment, and sources for reenacting the American Civil War. 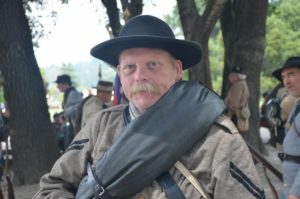 Jack Nakash is a Civil War Reenactor/Living Historian who currently portrays a Confederate soldier in the 14th Tennessee Volunteer Infantry, Co. B. He returned to reenacting in 2016 but has done both Union and Confederate impressions for a combined twenty years. He is a member of the American Civil War Association and the National Civil War Association. Jack is a US Marine Corps Veteran, lives in San Jose, CA, and is a retail clerk. Jack has been interested in the American Civil War starting at a very young age, and has participated in numerous Civil War Reenactments both in California and back East. He is a devotee of the Civil War “common soldier” and the life and trials of that soldier. Marcelo Pontin has been an Union Soldier Civil War Reenactor for the last three years in the 7th West Virginia Volunteer Infantry of the National Civil War Association and “represents” a Second Sergeant in that unit. He is a nine year veteran of both the United States Army and the Air National Guard in both Illinois and California. He currently lives in San Francisco, and is an engineer with AT&T. He also studies and lectures about history as a hobby. This entry was posted in Meeting archive on August 3, 2017 by hlj. Civil War Quiz: What Do You Know About Civil War Medicine? Q#1 – What were the main reasons infection was one of the main causes why a soldier died from his wounds? Q#2 – During the first year of the Civil War, frequent epidemics of which four childhood diseases was rampant in Union Army camps? Q#3 – Both Union and Confederate soldiers involved in military operations developed which four main illnesses? Q#4 – What liquid solutions were used during amputations to partially sedate patients? Q#5 – Today, it is known that if a wound produces pus, it means the injury is infected. During the Civil War, what did doctors think the presence of pus in a wound meant? Q#6 – For the Union, what was the ratio of casualties dying of disease? What was the ration for the Confederacy? Q#7 – For the Union, what was the name of the governmental agency that handled most of the nursing care of the armies, together with necessary acquisition and transportation of medical supplies? Q#8 – Because there were no antibiotics yet developed during the Civil War to deal with diseases, what treatments did many doctors and surgeons prescribe for their patients? Q#9 – In August 1861, what Union general appointed surgeon Charles S. Tripler as the first Medical Director of the Army? Q#10 – In February 1861, who appointed David C. DeLeon as Surgeon General of the Confederate Medical Department? Q#11 – During 1861 and most of 1862, why did the Confederacy employ a policy of furloughing wounded soldiers to return home for recovery? Q#12 – At the beginning of the war, the Union ambulance service was very ineffective for several reasons: poorly made vehicles, lack of organization, and corrupt and dishonest staff that manned the ambulances and sought to steal from the wounded passengers. What was the name of the individual who made significant improvements in the Union ambulance service? Q#13 – For both the North and South, approximately how many women volunteered to work in hospitals? Q#14 – In addition to assisting surgeons during procedures, giving medicines, supervising the feedings, and cleaning the bedding and clothes of patients, with what two very personal tasks did women assist wounded soldiers? Q#15 – For more than a century and a half, it has been accepted that about 620,000 Americans died in the Civil War. What is the name of the historian who in 2011 published a paper that described the use of demographic methods and sophisticated statistical analysis that produced a number of 750,000 soldiers who died in the war? This entry was posted in Quiz on August 1, 2017 by hlj.